Three sponsorship levels (Platinum, Gold, and Silver) are available to promote your brand and showcase new products to NASFAA members even before you set up your exhibit in Orlando. Not sure which level is right for you? Call Mary Nokes at (202)785-6958 or email nokesm@nasfaa.org. Let’s discuss your goals. Together we'll build the appropriate package to effectively deliver your marketing message. A sponsorship item (one) from corresponding level from the list below. Logo (Platinum and Gold) or a listing (Silver) in the online program PDF, app, on-site signage, website sponsor page, onsite screens at opening session and awards lunch. Post conference registration list sent immediately after conference. Ability to indicate new product or service on conference website. Company name will be listed on email blasts to conference attendees. May choose one Learning Lounge presentation at no charge. Note: Non-members pay a 30% premium on fees listed. Each sponsorship level has items and events included with that sponsorship. Once you select your sponsorship level, choose an item/event below. *SOLD* Badge Lanyards - All attendees will wear their badge lanyards throughout the conference, making this one of the most visible opportunities. Your company name will be imprinted on the lanyard alongside NASFAA name. *SOLD* Conference Registration Bags - Display your company name or logo with the NASFAA logo on each bag available at registration. *SOLD* Conference App - Your company will have exclusive advertising in the mobile app available to all attendees. We will highlight your company as the top sponsor of NASFAA in the mobile app and in materials promoting the mobile app to attendees. Reach both on-site attendees and attendees unable to be in Orlando. 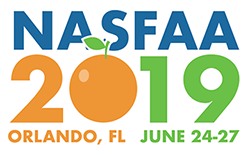 NASFAA will live stream and offer on-demand access to three concurrent sessions per session time slot as well as all general sessions (Total: 24 break-out and 4 general sessions). The sponsor receives brand advertising on all NASFAA Live informational web pages, promotion prior to and during the event in all marketing and reminder emails, and will have their logo displayed as part of the streaming template. All in-person attendees will have access to the On-Demand videos. Off-site attendees will have access to both the Live-Streaming and On-Demand videos. *SOLD* Relax and Recharge Lounge - Sponsor a lounge within the exhibit hall (a 20 x 20 space - exact location TBD). Each lounge will be set with tables and chairs and a water station where attendees can chat with colleagues or relax between visiting booths or recharge their wireless devices. A sign hanging above the lounge will display the sponsor's logo. At the sponsor's expense, the sponsor may provide brochures, writing pads and pens for the area. *SOLD* Water Bottles - Keep attendees hydrated by providing water bottles to attendees as they check-in at registration. NASFAA will provide coolers throughout the convention center for attendees to refill. Bonus - you will be helping the conference "go green" by sponsoring the reusable water bottles. *SOLD* Wi-Fi - Free internet access is the service most requested by NASFAA attendees. This sponsorship is certain to garner the sponsor much positive attention. As the sponsor of Wi-Fi access your company will be recognized on the internet access screen all attendees must view to log into the internet, on Wi-Fi log-in instructions on badge, in the online program PDF, on signage, and anywhere else the Wi-Fi access code is given. *SOLD* Conference at a Glance - Each attendee uses the Conference at a Glance to navigate their way through the conference daily. Your logo will be displayed on the front cover. *SOLD* Monday Night Opening Reception in Exhibit Hall - Signage in the hall and noted in the program. You have the opportunity to provide napkins or a gift ($10 or less) at company’s expense. *SOLD* Notepads - Notepads will available to attendees. As the sponsor, your company logo will be imprinted on each page of the notepad, along with the NASFAA logo. Tuesday and Wednesday Morning Beverage Breaks - These breaks will be set in the exhibit hall and near sessions. Sponsor will be recognized on signage, on the schedule, and has option to provide logo-branded napkins (at company's expense). Tuesday Networking Lunch in the Exhibit Hall - Your company will be recognized on lunch signs, on the schedule. Tuesday, Wednesday, and Thursday “Grab and Go” Coffee & Pastry - Attendees will thank you for their morning coffee and danish. Sponsors receive recognition on the schedule and signs in the food area. Twitter - As the official NASFAA Twitter sponsor of the 2019 National Conference you will be recognized on the conference website, on the Twitter feed, and in tweets and promotional materials sent by NASFAA to attendees prior to the conference. There will also be a monitor, branded with your company logo, displayed near a high-traffic area at the conference, which will show a live stream of tweets throughout the conference. Wednesday Lunch (Business Lunch and Awards) - Your company will be recognized on the large screens, lunch signs, on the schedule, and from the podium, and you will have the opportunity to provide a gift or literature packet (at company's expense). Gifts and giveaways (not more than $10 value total) are an option at company's expense. Your logo listed on the "First-Timers" page on the NASFAA conference website. Recognition at the "First-Time Conference Attendees Kick-off Networking Event" on Monday afternoon. As the sponsor, you can provide materials to be distributed during this event. *SOLD* Luggage tags - Your logo with NASFAA’s logo for 2019 Orlando Conference. Pens - Company provides pens with your logo for attendees. Approximately 2,300 required. *SOLD* Photo booth - company logo with NASFAA logo on photo booth/pictures at Monday night opening reception. Financial Aid Business Solutions (FABS) Seminar - Receive two 60-minute seminar time slots to promote your expertise and/or your products and services. Each seminar must be approved by NASFAA that reserves the right to limit the number of participating organizations of any type (e.g. lenders, software companies, etc. ), or to limit seminars on the same topic. FABS are held concurrently with Interest Sessions and are listed in the online program, app, and Schedule at a Glance. Your sponsorship level determines the cost. You may present the same topic twice or two different topics. Please submit your FABS topic online by April 5, 2019. Private Meeting Room (PMR) - A meeting room in the convention center for your exclusive use Monday through Wednesday. Room set and catering should be ordered directly through the Swan and Dolphin catering office. Internet and electrical needs should be ordered through vendors in the User Portal. The room will be empty unless you provide specs to the hotel. Once the PMR is paid for, you will receive the contact name at the Swan and Dolphin for more details on room set up. Please contact Mary Nokes for room location.